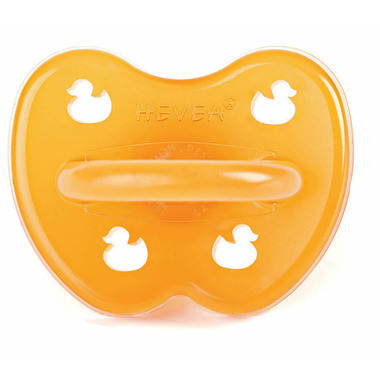 Hevea pacifiers are made from 100% natural rubber latex and is uniquely designed with ventilation holes. This ergonomically butterfly shape gives your little ones space for nose and chin and prevents vacuum around the mouth. This is the only pacifier my son would take. I tried so many different brands and finally found the one he likes. Best thing ever! Bought this for my 6 month old son because he liked the teething panda bear so much. He now loves this soother as well. It doubles as a teether and soother for him and it's easy for him to grasp and put into his own mouth. Bonus that he can chew on every part of this without worry and the gummy texture is gentle on his gums. I will purchase this product again. nice pacifier! easy to clean! Love this product. Serves as both soother and chew toy for teething. A great natural product. I love that it is only once piece so I don't have to worry about bacteria build up in joints or it breaking and being a choking risk. I also like that the natural rubber is darker than most pacifiers so I can see when build up is occurring and keep it clean! I've been using these soothers for 6 months. My baby loves them. She won't use the other types of soothers. They last a long time. The Hevea pacifiers are my favourite also- it's the only one I'll buy now. The Hevea pacifiers are my absolute favourites - so soft, all one piece, doesn't leave any marks on baby's face, and natural materials. My son loved his so much that I buy them for new moms at every baby shower I go to now. Our friends' daughter adores hers as well and won't even look at any other kind. 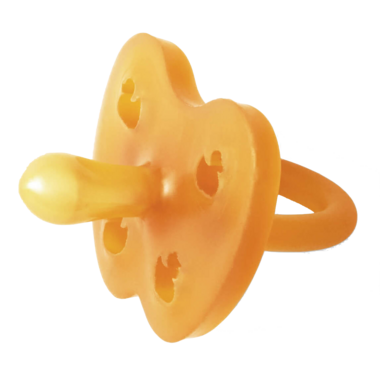 I really like this pacifier and after some initial confusion, so does my child. I just bought two more as i found i was often misplacing the one that i have. Easy to clean as there are no seams, joins etc. After initial sterilization have been rinsing off with hot water. I like the fact that it's made from rubber. Sometimes grit/grime gets stuck in the little cut outs but easy enough to pick off or remove with a rinse.